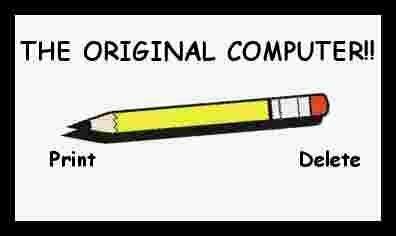 And if you had a 3 inch floppy . .
. . . you just hoped nobody ever found  out! Tech Support: "OK Fred, let's press the control and escape keys at the same time. to the sender when I was finished with it. He said he needed to keep it. Customer in computer shop: "Can you copy the Internet onto this disk for me?" something like this: Customer: "Hi. Is this the Internet? my spaceship and now it doesn't work." problems: the bottom half of her printed sheets were coming out blurry. It seemed strange that the printer was smearing only the bottom half. it to me. I told her to wait until the paper came out on its own. printed fine except for yellow. front of the screen, but the computer still couldn't find it. asked her to rotate the mouse so the tail pointed away from her. This guy calls in to complain that he gets an "Access Denied"
Tech Support: "Ok, let's try once more, but use lower case letters." Customer: "Uh, I only have capital letters on my keyboard." her printer. The tech asked her if she was running it under Windows. The woman responded, No, my desk is next to the door. But that's a good point. If the driver tells you so ?